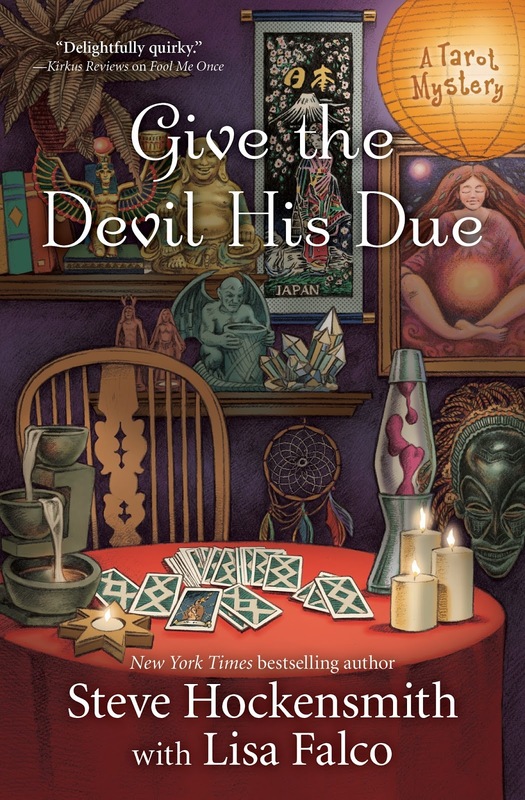 Reformed con artist-turned-tarot reader Alanis McLachlan gets paid for predicting the future—too bad she didn’t see all the trouble in hers. First a figure from her past tries to drag her back into the life of crime she thought she’d left behind. Then a new suitor tries to sweep Alanis off her feet, forcing her on-again, off-again romance with hunky teacher Victor Castellanos to hit the skids. And then there’s the little matter of the client who gets an ominous reading from Alanis . . . and is promptly murdered. Danger is in the cards for Alanis, and she’ll need all her skill at reading people and reading tarot if she’s going to survive. Steve Hockensmith’s first novel, Holmes on the Range, was a finalist for the Edgar, Shamus, Anthony and Dilys awards. He went on to write four sequels as well as a pair of bestselling follow-ups to the international publishing sensation Pride and Prejudice and Zombies. More recently, he wrote (with collaborator “Science Bob” Pflugfelder) the middle-grade mysteries Nick and Tesla’s High-Voltage Danger Lab and Nick and Tesla’s Robot Army Rampage. I have a confession to make: I’m a guy. That’s probably not a big surprise if you were paying attention to who was writing this. If a woman wanted to write under a male nom de plume, why the heck would she choose “Steve Hockensmith”? Brock Dashwood – now there’s a pen name! That dude’s got a yacht and a six-pack (and not the kind I have in the fridge with “Pabst Blue Ribbon” on the bottles). When I say I’m a guy, I don’t just mean biologically…though in these anything goes times, I suppose it’s not a bad idea to be 100% clear about that. So, yes: I am biologically male. I think in the modern parlance that’s “cis male”…? Which sounds a bit like “sissy male” to my confused guy ears. And that’s a bit ironic, as “sissy male” is exactly how my peers in high school probably thought of me. Because I’m a guy, you see, but I’m not necessarily a guy’s guy. I love Westerns. I’m fascinated by World War II. I hate asking for directions. Guy! I don’t think cars or motorcycles are cool. I find football to be kind of stupid. I never had Farrah Fawcett Majors or Pamela Sue Anderson on my bedroom wall (or on my mind). Not so guy-ish. I love barbecuing. I love beer. I have a hard time dressing myself in matching clothes. Guy! I get a deep, soulful sense of satisfaction from cooking for my family. I waste long stretches of time watching cat videos on Facebook. I can’t stand professional wrestling or the Three Stooges. I like martial arts movies. I’m terrible with names. I hate talking on the phone. Guy stuff, right? I like books and movies and TV shows with a light, comedic approach to murder mysteries. I prefer protagonists who aren’t hard-boiled macho men. I dig it when the crime genre doesn’t take itself so seriously. In other words: I like cozies. Do I have to turn in my guy card now? 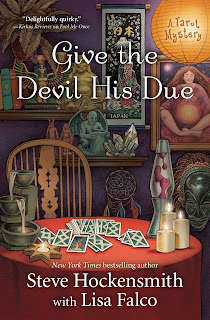 I’ve written three cozy-ish novels with a female partner and a female protagonist – the third book, Give the Devil His Due: A Tarot Mystery, just came out – and as I was planning the series I was aware that I’d need to get in touch with my feminine side. So when it came time to make up a name for the town our hero, tarot reader Alanis McLachlan, would have her adventures in, I went with “Berdache, Arizona.” “Berdache” being an old, not particularly politically correct (I’ve since learned) term for Native American “two-spirit people” – i.e., individuals who are neither purely male nor purely female. And “Arizona” being…well, Arizona. I liked basing Alanis in a place called Berdache because she has a mixture of stereotypically feminine and masculine traits herself. She’s cocky and jaded and wise-cracking but vulnerable and empathetic, too. Plus, she’s a creation of a man and a woman: me and my partner on the series, tarot expert Lisa Falco. But I’m realizing now that I’m a bit of a Berdache myself. At least to this extent: I like baseball and the Bee Gees, I enjoy cheap beer and fruity cocktails, and I respect hardboiled detective stories and noir…and cozies. I really think your book sounds interesting. My husband also enjoys anything about WW2 and he doesn't like football. 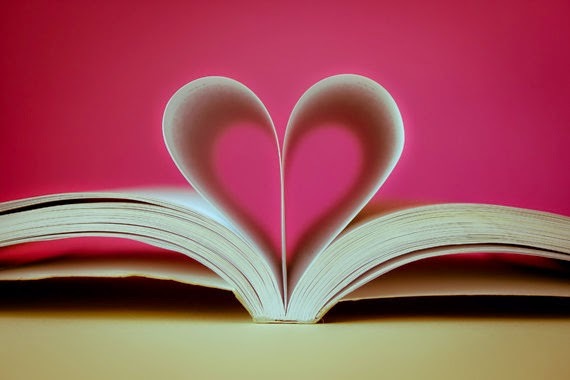 I enjoy reading books written by guys! 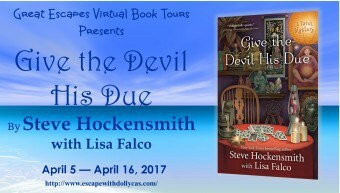 Steve is a new author to me and I really enjoyed the synopsis of the book and I'm looking forward to reading the book.